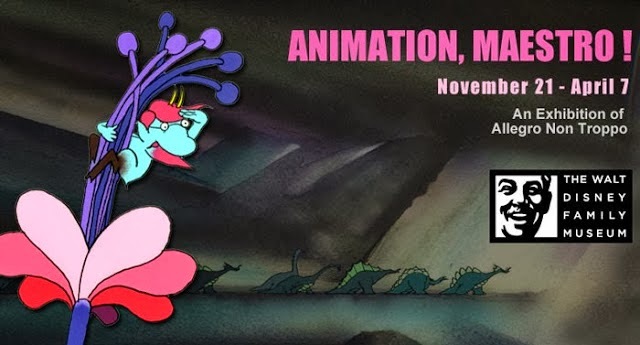 The Walt Disney Family Museum is pleased to present the exhibition Bruno Bozzetto: Animation, Maestro! On view in the museum’s Theater Gallery from November 21, 2013 to March 17, 2014 this exhibition organized by animation historian and critic Federico Fiecconi, spotlights some 60 original pencil animation drawings, cels, and backgrounds from the filmography of the renowned Italian animator, director, producer, and cartoonist Bruno Bozzetto (b. 1938). 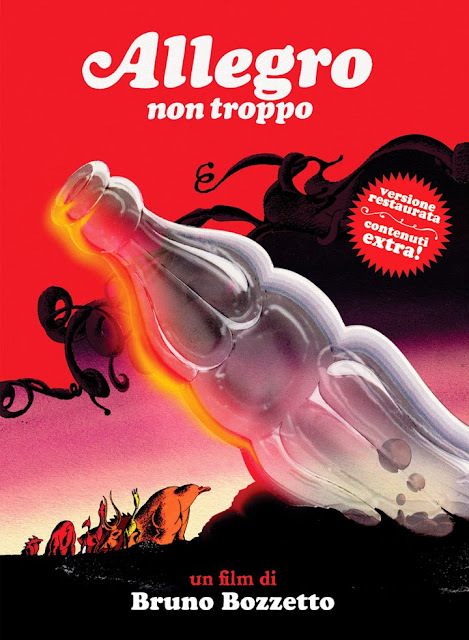 Most of the featured works come from his most celebrated masterpiece film Allegro non Troppo (1976). Inspired by classic Disney films including Fantasia (1940) and Bambi (1942), Bozzetto debuted in 1953 at the age of 15 with a Donald Duck-themed short. He quickly developed his own distinctive personal style, becoming one of the most eclectic and innovative independent animators, directors, and producers in the industry. For almost six decades, working both independently and through his company Bruno Bozzetto Film, he has produced and created animation shorts, commercials, TV series, and four full-length feature films including the iconic West & Soda (1965) and VIP, my Brother Superman (1968). His short films have also earned an Academy Award nomination, a Berlin Golden Bear, and more than 100 international awards. Bozzetto’s work represents the perfect link between classic Disney style and a contemporary, modern approach to animation focused on storytelling, character development, brilliant design, and humor. “Bruno Bozzetto’s films have been one of the greatest inspirations for me as an animator and storyteller. He has created some of the funniest animated films ever made and is one of the most clever storytellers around. Bruno’s designs are so appealing and his comic timing is truly unsurpassed,” comments John Lasseter, chief creative officer at Pixar and Walt Disney Animation Studios. Earlier this year, Bozzetto was awarded the highly respected ASIFA (Association Internationale du Film d’Animation/International Animated Film Association) prize “for outstanding achievements in the art of animation.” The award included an original artwork by Bozzetto’s beloved inspiration Tyrus Wong, the art director for Bambi and the inspiration for his “less is more” approach to animation. The exhibition is aptly timed with Water to Paper, Paint to Sky: The Art of Tyrus Wong currently on view through February 3, 2014 in the museum’s Special Exhibition Hall. Bruno Bozzetto Channel on YouTube. Production cells from the film. A 2009 interview with Maurizio Macchi.